Near-complete results from Turkey's election show the Justice and Development Party (AKP) of PM Recep Tayyip Erdogan has won a third term. With 99% of ballots counted the AKP had 50% of the vote, which local media said translated to 326 seats in parliament. But that would be 41 seats short of the two-thirds majority needed to amend the country's constitution unilaterally. 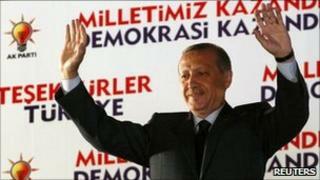 In his victory speech, Mr Erdogan said the AKP would "discuss the new constitution with opposition parties". "The people gave us a message to build the new constitution through consensus and negotiation," he told supporters in Ankara. "We will be humble. We have never displayed pride or boasted." The secular Republican People's Party (CHP) had 26% of vote and the far-right Nationalist Movement Party (MHP) 13%. More than 50 million people, about two-thirds of Turkey's population of 73 million, were eligible to vote in Sunday's election. NTV television said turnout was 84.5%. The BBC's Jonathan Head in Istanbul says Turkey faces another four years with Mr Erdogan the dominant figure, and his AK party pretty much able to do what it likes in parliament. It did not take long for the count to show what everyone here had expected - another decisive victory for the governing Justice and Development Party (AKP). The result is a powerful endorsement of the blend of economic liberalism and religious conservatism offered by Prime Minister Recep Tayyip Erdogan. With this win, he is now the most powerful political figure in Turkey since the days of the country's founding father, Kemal Ataturk. The main opposition party, the CHP, under its new leader, Kemal Kilicdaroglu, did offer a more appealing alternative for secular Turks than in previous elections. But it still got less than a quarter of the votes cast. And in the south-east, there was a strong vote for Kurdish candidates, which will put pressure on Mr Erdogan to make a more convincing effort to resolve the long-running conflict between the state and the large Kurdish minority. Turkish voters have given Mr Erdogan an impressive mandate. The question now is, what will he do with it? After his last election victory, he promised to be a bridge-builder, a prime minister for Turks from all walks of life. But in practice he proved to be an abrasive and divisive leader. His opponents will now be hoping he adopts a less confrontational style. Because the MHP passed the 10% threshold for a party to enter parliament, the AKP was denied the two-thirds "super majority" and will not be able to push through a new constitution without putting it to a referendum, our correspondent adds. And the AKP's failure to win at least 330 seats means it will not even be able to put amendments to the public without consulting the opposition. The party won 341 seats in 2007. The CHP meanwhile won 135 seats, 23 seats more than last time, and the MHP 54, 17 seats fewer. Under its new leader Kemal Kilicdaroglu, the CHP ditched its image as a supporter of military intervention in politics, fielded young candidates, and presented itself as a champion of European social democratic values. Turkey is a member of Nato and a candidate for European Union membership. CHP leader Kemal Kilicdaroglu said it was the best showing by the party of Mustafa Kemal Ataturk, the founder of the Turkish republic, since a military coup in 1980. "We wish all success to the AKP, but they must remember there's a stronger main opposition party now," he told supporters. Independent candidates fielded by the pro-Kurdish Peace and Democracy Party (BDP) also did well in the south-east, winning 5.8% of the vote and 35 seats. Our correspondent says this will increase pressure on the government to address its long standing demands for greater autonomy and official recognition of Kurdish identity. "Our people want the Kurdish issue to be solved through peaceful and democratic methods. We will work for it and will struggle to meet the demands of Kurdish people with the new constitution," Serafettin Elci, a prospective MP for the city of Diyarbakir, told the Reuters news agency. The AKP, which has Islamist roots, has presided over strong economic growth and a more assertive foreign policy since taking power in 2003. It has also seen unemployment fall - down to 11.5% in March from 14.4% in the same period last year. The country is a member of Nato as well as a candidate for membership of the European Union. The AKP put its economic record at the centre of its campaign, promising an ambitious programme of new construction if elected. Projects included a canal from the Black Sea to the Aegean, a new city outside Istanbul and new bridges, airports and hospitals. Casting his vote in Istanbul, Mr Erdogan said he hoped the election would "contribute to strengthening of peace, rights and freedoms". Earlier, he shook hands with supporters outside the polling station, who burst into applause and chanted: "Turkey is proud of you."